Sensational discoveries of mosaics periodically make the headlines of newspapers in Turkey. After being discovered, unearthed, cleaned, and removed, these ancient floors slowly make their way to museums or private collections. I wish to examine the curious afterlife of mosaics in, out of, and more recently, back to Turkey. * I want to analyze their transformation from buried and forgotten things in the ground, to sanitized artifacts, aesthetic masterpieces, and contested objects of desire. Unearthed in the late 1990s at Zeugma in Southeastern Turkey during rescue excavations before the construction of the Birecik Dam, the 2nd century AD mosaic below is now displayed in the newly built Mosaic Museum of Gaziantep. It shows Achilles on the island of Skyros leaving for the Trojan War. Thetis, Achilles’ mother, knowing that her son would die by joining the Greek army, dresses him as a girl and sends him to live with a king and his beautiful daughters on the island of Skyros, far away from the war. On the island, Achilles falls in love with one of the king’s daughters, Deidameia, and even has a son with her. Odysseus, desperately looking for Greece’s greatest warrior, hears rumors of Achilles’ whereabouts. Disguised as a merchant bringing gifts to the king’s daughters, Odysseus enters the palace, opens a chest full of jewelry in which he has also added a few arms and armors. Achilles, the only “daughter” fascinated by the swords and shields in the chest of gifts, is tricked and has to reveal his true identity to Odysseus. 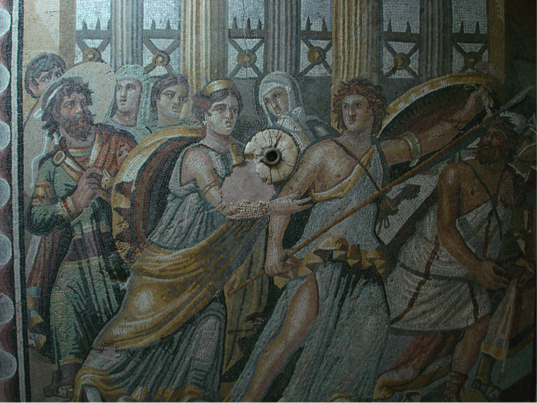 This story serves as an allegory for “The Cultural Afterlife of Mosaics in Turkey.” Achilles, hidden by his mother, living on an island, undisturbed by the war, momentarily escapes his destiny… until Odysseus tricks him, reveals his true identity, carries him off to Troy, and eventually brings him face-to-face with his own mortality, his fate as well as his fame. Mosaics also hide for years and years, covered under layers of earth, lying quietly undisturbed by the affairs of this world… until archaeologists unearth them, clean them, detach them from their original context, and transport them, sometimes across oceans, to be displayed in museums, where generations of visitors will be able to gaze at them, admire the ancient craftsmanship, and remember the stories of love, separation, bravery, but also deceit, trickery, and cowardice, they once told and continue to tell. In other words, if it is thanks to Odysseus’ trick that Achilles’ name will forever be remembered, it is also thanks to archaeologists, and other humans who like to “dig” things out of the ground, that mosaics in Turkey will also forever be remembered. For archaeologists, mosaics are both a blessing and a curse. A University of Nebraska team working at Antiochia ad Cragum looks forward every season to unearthing more of its large Roman mosaic. Once unearthed, however, mosaics require care and protection. In the 1990s, the team at Sardis, interested in the site’s older Lydian levels, had to remove a large mosaic floor. It was excavated, photographed, catalogued, removed, and protected until a fire destroyed the building in which it was stored. Unlike potsherds or beads, large decorated floors composed of small intricately carved tiles can become a burden and give archaeologists preservation nightmares. This fascination for mosaics can perhaps be traced back to the 1930s in Hatay, at a time when surveys by Robert Braidwood of the Amuq Plain, and excavations by Sir Leonard Wooley at Tell Atchana began to reveal the region’s rich past. During that time period, Princeton University led a consortium of museums to Hatay in search of Antioch’s ancient monuments and treasures. The expedition unearthed more than 300 mosaics. If half of these are dispersed today amongst 20 museums and private collections around the world, the other half remained in the Hatay Archaeology Museum of Antakya opened in July 1948 to celebrate the 10th year anniversary of the region joining the Turkish Republic. This year, with the financial support of IBM among other companies, a new Hatay Archaeology Museum, 10 times larger than the original one, will be inaugurated in an effort to display more of its mosaics. Antakya has recently been replaced by the city of Gaziantep as the owner of Turkey’s largest mosaic museum. In the late 1990s, an international rescue project was launched to save Zeugma from the rising waters of the Birecik Dam reservoir. The site’s mosaic floors were safely transported to Gaziantep’s old Archaeology Museum, and later moved to a new state-of-the-art. Mosaic Museum inaugurated last year in the city. 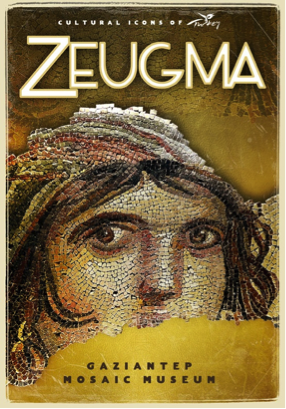 Much attention has also been given to the site of Zeugma itself. A $1,5 million, climate-controlled, structure was built to protect its ancient houses, as well as a wall to prevent damage from the reservoir’s waves. A pathway for visitors to walk on during their tours, accompanied by information panels, is also in the plans. More work remains to be done however. In order to open the Zeugma Archaeological Park, the Ministry of Culture and Tourism needs to buy the remaining 3/5 of the site from local private farmers. Nearby, Urfa will also soon possess its own mosaic museum. In 2005 workers in Haleplibahçe digging for the city’s sewage system hit upon some mosaic floors. Ancient Edessa had always attracted pilgrims with its Sacred Fish Pond, its historic bazaar, and Abraham’s birthplace. Today, 5-star hotels are rapidly being built and abandoned Armenian houses restored into restaurants near the city center. More and more “Eastern Tours” are being organized from Istanbul for Turkish tourists to explore their exotic “East.” The mosaics, conveniently located near the major pilgrimage sites and newly built hotels and restaurants, offer the municipality an economic opportunity as another potential tourist attraction. Within two years, a new ArkeoPark with its mosaic and archaeology museums will see the day. Even Prime Minister Erdoğan and his government became involved in this seemingly lucrative mosaic business investing an additional 38 million YTL in this very pro-AKP city. Archaeologists, governments, municipalities, as well as the private sector are showing interest in mosaics. Back in Antakya, during construction work for a new hotel, bulldozers hit upon a large mosaic floor. Upon hearing the news, the owner of the hotel, a local Antakya businessman, immediately contacted the city’s museum to report the find. Construction work was allowed to continue under strict supervision from the museum. After the discovery, the architect changed the design of the building to allow guests the opportunity to gaze upon the ancient mosaic floor from their rooms, and the owner changed the hotel’s name to Antakya Mosaic Hotel. Under the supervision of the Antakya Museum, and at a cost of $60 million, it is planned to open in April 2013. Our quest for the cultural afterlife of mosaics now takes us outside of Turkey. 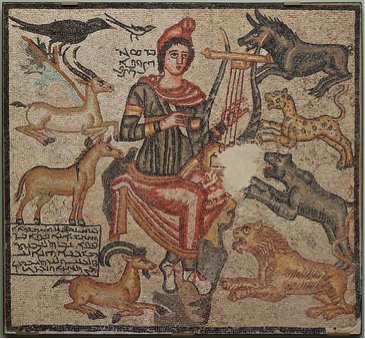 The Orpheus Mosaic, a 2nd century AD mosaic with Syriac inscriptions that trace its origin back to Urfa, was bought in 1999 from Christie’s by the Dallas Museum for $85,000. Similar mosaics began to appear on the Antiquities Market as early as the 1950s. Knowing that Turkey is aggressively pursuing the repatriation of its looted objects, the Dallas Museum decided to voluntarily return the mosaic last December. A small loss, however, for what could be a huge gain. Using the publicity surrounding the return of the mosaic, the museum will launch an ambitious exchange program with international museums and foreign institutions. In exchange for the Orpheus Mosaic, Turkey, for example, has promised to loan the Texas museum Anatolian objects for future exhibits. Another set of mosaics from Turkey, now housed at Bowling Green State University in Ohio, waits on a legal decision to know of its future whereabouts. Like the Orpheus Mosaic, however, the likelihood that the Bowling Green mosaics return to Turkey is high. Once discovered, excavated, unearthed, cleaned, rolled up, stored, preserved, sometimes transported across oceans displayed in far-away museums, mosaics often experience strange cultural afterlives. The Antioch Mosaics found by the Princeton Expedition in the 1930s quickly became desired artifacts for cultural institutions across the world. Once taken out of their original context, they become museum objects and simultaneously acquire aesthetic and monetary value. Decontextualized, they become entangled in a complex network where science, government, politics, law, and money play an important role. In their cultural afterlives, mosaics position themselves between legality and illegality. They also receive much attention for their economic value as potential tourist attractions. Not only have the private sector, local governments, and the Turkish Ministry of Culture and Tourism taken notice, but Prime Minister Erdoğan himself has become interested in the economic significance of mosaics. And, as their cultural and economic capital increases, some mosaics have even reached the status of national icon, appearing as part of the Turkish Ministry of Culture and Tourism logo. Mosaics in and out of Turkey cannot escape their faith, destined to be forever remembered, sanitized, and sacralized as they are displayed in curated spaces, protected by rope barriers and “Do Not Touch” signs, placed under the careful eye of conservation experts, and preserved from natural decay by science. Fully decontextualized, of course, but always admired, photographed, and worshipped in museums across the world. Mosaics in and out of Turkey, a country which itself has often been described as a “cultural” mosaic, a landscape composed of a diversity of cultures, civilizations, languages, ethnicities and religions. 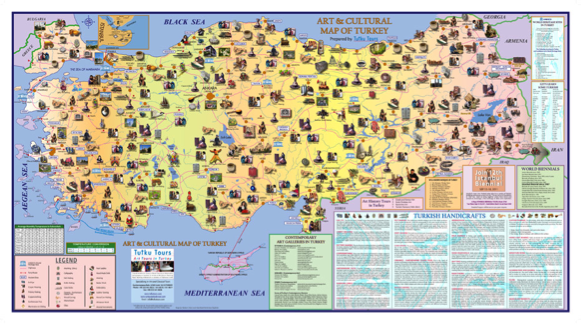 If Turkey frequently experiences a kind of anxiety concerning the disintegration of its national borders, perhaps attempting to keep all of its mosaics at home is an attempt to overcome this fear. In any case, the cultural afterlife of mosaics has much to tell us about a country, which like a mosaic can be understood as fragments of a larger whole. Posted in Anthropology, Archaeology, Cultural Heritage, Ethnography, History, Museums, Repatriation, Restoration, Tourism, TurkeyBookmark the permalink.